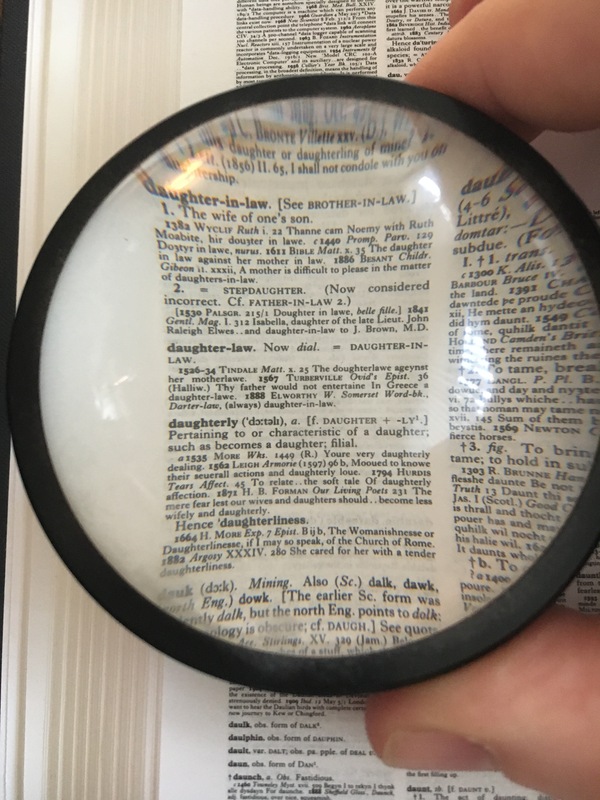 Looking up daughter-in-law in my unabridged Oxford English Dictionary. I am a collector of dictionaries. I love browsing dictionaries, thesauruses, encyclopedias, and other references. But while I can be very pedantic and love reading dictionaries (comparing the various definitions and variants from one to another, teasing out interesting bits of the history of the language in the process, and discovering new nuances of meaning and usage), I am not a Prescriptionist. I don’t insist that people must always use words only one particular way. But another reason they irritate me is that the dictionary definition of the word “word” is “a sequence of sounds or morphemes intuitively recognized by native speakers as constituting a basic unit of meaningful speech used in the forming of sentences.” In other words, if the people listening understand it, it’s a word. But sometimes I run across a word or turn of phrase that I understand, but wonder why it’s needed. The last few years I’ve noticed a bunch of my evangelical relatives and their friends referring to the wives of their sons as “my daughter in love” and the husbands of their daughters as “my son in love.” Now, the first time I saw it in a Facebook update or where ever I read the update, I thought maybe it was a bit of autocorrect weirdness. I admit, one reason it felt like virtue signaling to me is that, because most of the people I saw using the term are folks I’ve known for many, many years, I couldn’t help notice that one person with a gay son who happened to be married to another man kept referring to the husband of her son as “his friend.” I suppose it could be worse—she’s not calling him her son in shame or anything like that. The Oxford English Dictionary cites as the first use in writing of the term “daughter-in-law” in the year 1536, but traces the use if the suffix “-in-law” (though it was spelled “yn law”) a couple of centuries earlier to approximately the year 1300. Daughter-in-law usually refers to the wife of one’s son, though it was sometimes used also to refer to step-daughters. Brother-in-law is oldest form of the suffix, which can refer to the brother of one’s spouse, the husband of one’s sibling, or even the husband of the sibling of one’s own spouse. The law in question, by the way, isn’t related to civil marriage laws. The original sense of the word comes from older religious and social prohibitions against marrying the widow of one’s own brother. The widow can’t marry her late husband’s brother, because in the eyes of Sammy the Supreme Being or whoever, her late husband’s brother is the equivalent of her own brother. Once the person has married into the family, they become the equivalent of a blood relative to the other members of the family. and doesn’t begin to describe our relationship. Law has nothing to do with it… but LOVE does. It’s the kind of poem my grandmother would have described as “lovely.” Words I find more accurate are “cheesy,” “corny,” “cloying,” “schmaltz,” and “eye-rollingly bad,” It is also way, way too long for a reading at a wedding and I feel great sympathy for any people who have had to sit through a reading of it. Since variants of this thing have apparently been read (or at least considered for reading) at the weddings of people who turned to the internet rather than the Book of Common Prayer for guidance on their religious marriage ceremony, I could see how “daughter-in-love” as a preferred term for the wife of one’s son would catch on in certain evangelical circles. I do find it ironic that the original meaning of the “in-law” suffix came from religious law, and now the same people who are always clamoring about how god’s law should override man’s law are trashing a bit of god’s law under the uninformed notion that this word has something to do with the legislative code. But then, those folks aren’t known for reading much of their own holy book, anyway. Why should I expect them to know how to use a good dictionary?